Do you remember . . . ? Disneyland: I knew the time would come when I would be taking my kids to see Mickey and Sleeping Beauty. The moment of truth came this past spring when I took my 2 1/2 old daughter to Disneyland. In many ways Disneyland is as I remember it from my youth, except that several attractions are just not there anymore. The Skyway that took visitors from Fantasyland to Tomorrowland was, it turns out shut down in 1994; Adventure Thru Inner Space closed in 1986; and the Country Bear Jamboree closed in 2001. The absence of these attractions, I've got to admit, left me a bit disoriented. The seeming physical permanence of buildings and things that we've seen or experienced leaves an impression on us and creates environments in which we count on their presence to orient ourselves. In some sense, returning visitors who walk along 14th Street today, past the west grounds of the National Museum of American History (NMAH) may very well experience what I did at Disneyland. What greets them is a bare concrete platform in the middle of a drained moat. Some may think, "Didn't there used to be a black metal sculpture there?," while others may think, "Didn't there used to be a bandstand there?." Depending on when you last came to Washington, DC the answer to both questions would be, "Yes, there was." Installed in 1969 and a gift from The Morris and Gwendoyn Cafritz Foundation, The Gwenfritz stabile by Alexander Calder that was once located in the outdoor amphitheater near the west end of NMAH was relocated in 1984 to the northwest section of the museum's grounds to make room for the installation of a 19th century bandstand that was a gift from the State of Illinois. The bandstand was to serve as a centerpiece for the amphitheater and as a venue for concerts presented in warmer weather months. The Jacksonville Bandstand was built from 1878-1879 on the grounds of the Illinois Central Hospital for the Insane at Jacksonville, Illinois, which is now known as the Jacksonville Developmental Center. The Victorian structure, made of pine wood, is approximately 33 feet long and 14 feet wide. It has a cedar shingled, multi-angled roof that is supported by 20 columns that are connected by railings adorned with ornamental wooden fretwork. 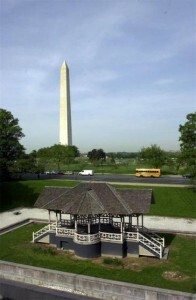 The bandstand was dismantled during the summer of 1983 by Smithsonian staff and transported to the Smithsonian's storage facilities in Suitland, Maryland. With only a few repairs, the bandstand was restored to its original appearance and its original color scheme was maintained: cream for the basic structure, Venetian red trim, blue-gray ceiling, and red-stained shingles. 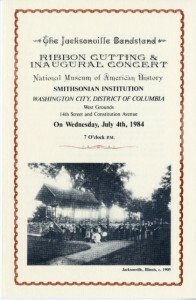 Dedicated on July 4, 1984; the bandstand became the site of concerts whose programs reflected the eclectic repertoire of late 19th century band music and included everything from Wagner and Strauss to polkas and patriotic songs. Among the groups that performed there were the United States Army Band, the Bass Wingates Band, the United States Marine Band, Orquesta Calidad, Howard University Jazz Ensemble, and the Cardozo High School Marching Band. To hear a clip of "Fanciful Sundries From the Time of King James" performed by the United States Army Band (and courtesy of the US Army Band website), please click below. 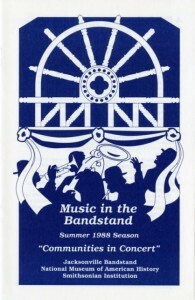 Concerts were held at the Jacksonville Bandstand until 1988, when they were discontinued due to changing traffic patterns on 14th Street and accessibility issues for the site. 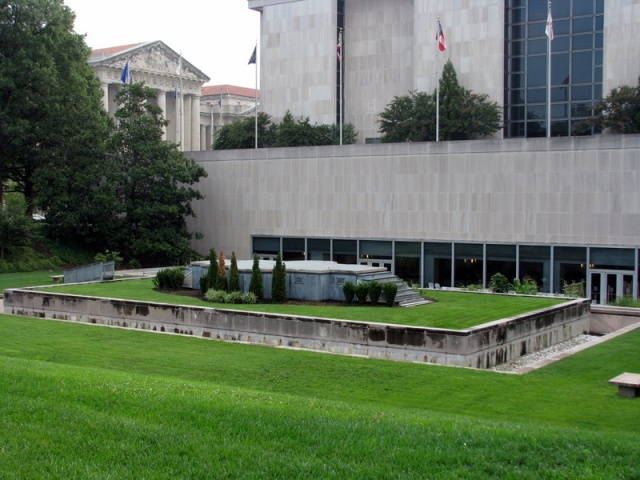 NMAH received an allocation from the Architect of the Capitol to dismantle and preserve the original components of the bandstand, and in January 2010 it was removed from its site. After 25 years in Washington, DC, the bandstand was returned to its original home in Jacksonville, Illinois, where it will find a new site to be remembered at the Prairie Land Heritage Museum. The vacated site where the Jacksonville Bandstand once stood will not remain vacant. 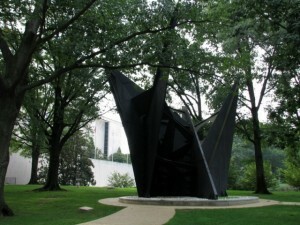 In the future visitors will once again see Calder's The Gwenfritz sculpture there as NMAH plans to move the sculpture back to its original location.